The estimated figures for Bersih 4.0 has gotten everyone confused. 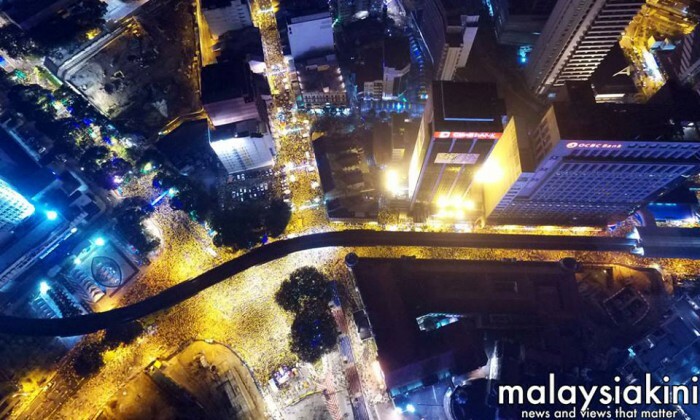 Bersih claimed that 500,000 people took part in the 34-hour rally, while PM Najib played the numbers down to 20,000 people. Berita Harian reported a total of 22,000 participants and added that 80% of them were Chinese. According to Deputy Home Minister Datuk Nur Jazlan Mohamed, the police’s total 2-day estimate is 50,000 people (25,000 people as of 3pm on Saturday). 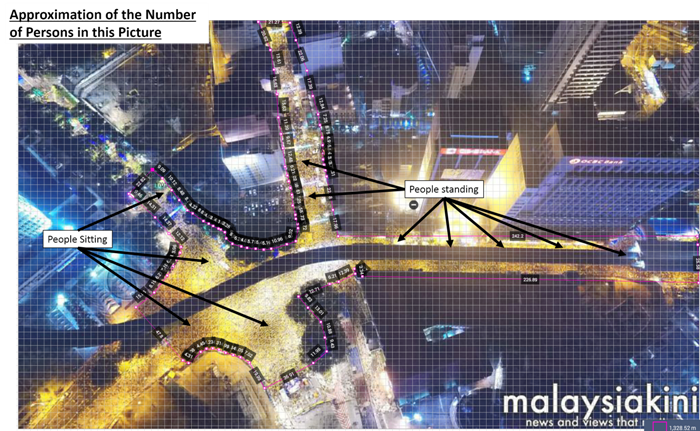 Seeing as there is quite a disparity between the figures, a Vulcan Post reader, Alwin decided to try to investigate and determine a better estimate of the number of participants at Malaysia’s most successful Bersih rally yet. 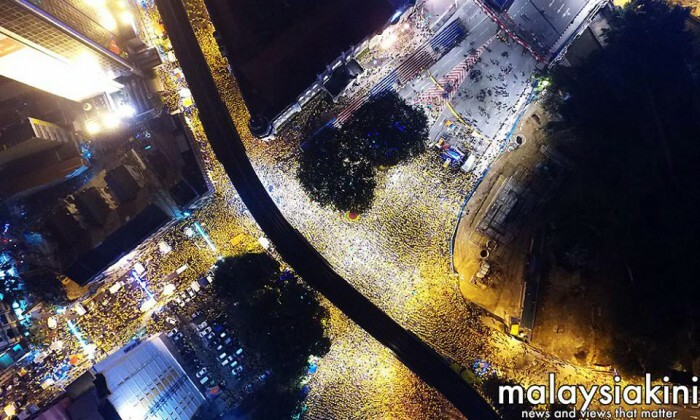 “I’ve used Malaysiakini’s aerial photograph of the crowds in Dataran Merdeka vicinity during the night of 30th August and roughly estimated the total area that contains participants in square meters (sqm),” he explained. So first he has to find out the scale of the picture, calculate the total area of people, then use an approximate human density to find the total people in that area. 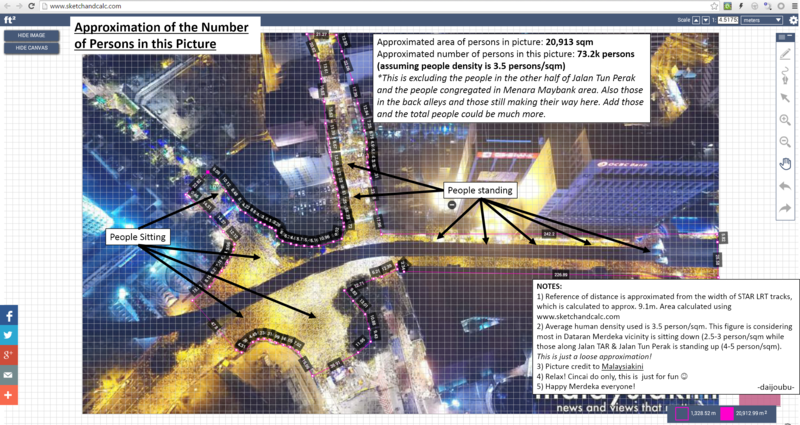 “The reference used to set the scale of the picture is the width of the LRT track, which is approximately 9.1m. And the area was estimated using www.sketchandcalc.com, which came up to 20,913 sqm. He took time to put notes for us too. Why, thank you, kind sir. With those figures, he calculated that the total participants in that Malaysiakini photo is approximately 73.2k people in an area of 20,913 sqm (3.5 persons/sqm multiplied by 20,913 sqm). It should be noted that this is an instantaneous number, meaning that it is the total of participants at that point of time and it excludes other Bersih 4 participants that came and went home earlier in the day or on the previous day. It also excludes the people at other parts of KL that are not shown at that time (there are still many more in the other half of Jalan Tun Perak and at Menara Maybank area). Considering the ones available there, it isn’t too far-fetched to claim that there is at least 100k participants at the same time on that night of 30th August. Alwin is not alone in his efforts to determine the number of people present at Bersih 4.0. And his method might not be that accurate either. Cilisos, too has attempted to form their own hypothesis and they make an admirable attempt in their article here. Although none of us can accurately tell the exact number of people present, their conclusion is similar to Alwin’s—the official figure given by the police and the PM is too low. Who Cares About The Numbers Anyway? 50,000? 70,000? 100,000? What does it really matter? Honestly, I don’t think the exact figure matters—not to the participants themselves anyway. Because to those participants who were present, they don’t need to know the exact figure to know that they were a part of something bigger than themselves. For people who were not present but have access to social media, they can see the large crowds from various Bersih pictures. The problem doesn’t lie on the exact figure, but rather it is that some quarters would appear to be downplaying the numbers to spread false news. Educating the public about what really happened during the event seems to be obstructed, and to those who support Bersih, that only serves to strengthen the necessity of it.